What Is The Osaki OS 7200H? #1 Total Of 51 Airbags! 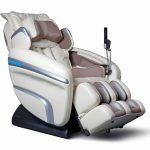 Who Should Buy The Osaki OS 7200H Massage Chair? But What If You Don’t Live In The US? 51 Airbags Make This The Best Compression Chair Available! Built In Speakers With Smart Phone Connectivity! Osaki has quite the selection of entry level, mid, and high end massage chairs. OS 7200H is an excellent example of a mid level chair. It’s less than $4K and boasts a ton of cool features. As far as intensity is concerned, you can expect a fairly strong massage. Expect A Fairly Intense Massage! If you’ve been reading my previous reviews, you’ll notice a lot of similarities between each massage chair. However as similar as they may be, there are still variations. These subtle nuances are very important to understand because in the end they make all the difference! I’ll do my best to highlight these “small” variations throughout this post. Airbags simply inflate with compressed air to then provide a compression style massage to surrounding muscle. Obviously A Lot Of Compression!—Which is a good thing if you’re a fan of compression massage. I personally think compression massage is very effective and relaxing at medium to low intensities. High intensity compression is definitely not my thing! You Need More Valves & Pumps—Needed to inflate all 51 airbags. As a result, you may see a slight increase in power consumption. This is why airbag design and selection can be a lot more complicated than you think. I always say it’s all about finding the right balance instead of simply adding more. All that being said, the 51 airbags definitely makes the OS 7200H massage chair very good at compression! The 51 airbags have been strategically placed in different areas where the rollers are unable to reach. The picture below shows airbag placement. Look At All Those Airbags! Rollers and airbags are 2 very integral components to a massage chair. I would even argue that rollers are more important than airbags, simply because they are responsible for delivering a variety of massage techniques (kneading, rolling, tapping etc.). The roller system is in my opinion the most critical component in any massage chair! 31” Track Span—31” is the track span, or the distance traversed by the rollers. Twin rollers begin the massage at the neck, and then slowly make their way down the back until they reach the lower back at a distance of 31”. Pretty simple right? S-Track—Fancy way of saying the rollers will mimic the backs’ curvature i.e. since our spine is “s” shaped, twin rollers will take this into account as they traverse the back. A pretty decent roller system in my opinion, although I am a little disappointed with the 31” span. For a mid end chair, I expect a little more. It does feel like Osaki gave more emphasis to airbags for this particular chair. Ahh yes zero gravity….everyone’s favorite! Notice how tons of manufacturers are all starting to incorporate zero gravity into their designs? Nissan’s starting to use them in their cars, Emirates’ first class seats are capable of reclining to zero gravity, and even sofa set (and chair) manufacturers are taking note! First and foremost, what is zero gravity? In layman terms, zero gravity is a seating position where your legs are elevated with respect to your heart, such that a torso to leg angle of about 128 degrees is formed (source: emassagechair). The benefits to sitting in such a position include increased circulation, expanded lung capacity, and reduced tension on the spine and muscles. The Osaki OS 7200H has 2 zero gravity positions to choose from: stage 1 and 2. 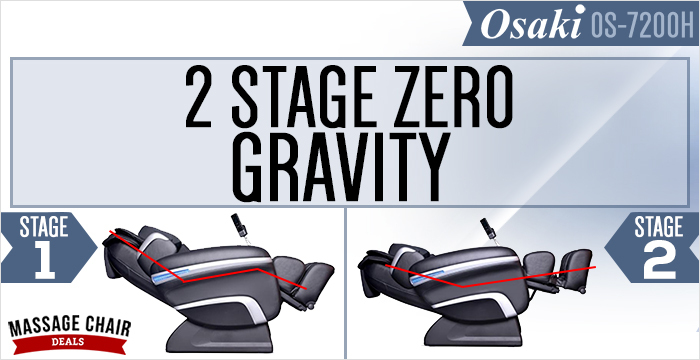 Stage 1 is the “normal” zero gravity position, and stage 2 is a more reclined version of stage 1. What’s with all the buzz surrounding zero gravity? Is it worth the hype? I’ve used zero gravity recline on my massage chair several times, and I think it’s a nice feature to have. I feel it’s the closest you can get to actually laying down as you would in a “traditional” massage. What’s also nice is being able to watch TV while being reclined in zero gravity! The foot rest in the OS 7200H automatically extends/retracts based on an individuals leg length. Important to note that this isn’t a feature common to all Osaki chairs! In fact most older Osaki models employ a spring loaded foot rest instead, where you have to manually push down to hold position. Having said that, I think an automated foot rest is definitely a plus! Footrest Adjusts Automatically Based On Leg Length! Note: footrest length can also be manually adjusted using the remote. Recovery—A mode tailored to massage the entirety of the back and neck areas using different massage strokes. Lower Back—Interestingly enough this isn’t just a lower back massage, it’s also a calf massage too. Think of it as a lower body type massage! Muscle Relief—Starts of nice and slow and then gets pretty intense later on! Full body massage with a lot of emphasis on the lower back area. Upper Body—Uses a combination of techniques including compression to mostly target the head, neck, and shoulder areas. Wake Up—Another full body mode, but this one’s definitely at a lower intensity. A good choice for anyone looking for a light, relaxing massage! Anti Stress—Full body mode that focuses mainly on the neck area by using 5 different massage techniques! A good selection of preset modes to pick from that offer varying intensity. Osaki usually never disappoints when it comes to auto massage options! You can connect your smart phone via auxiliary cable to the massage chair sound system. The OS 7200H has speakers located on either side of the shoulder massagers, so expect a boom! What’s also pretty neat is that the massage syncs to the beat of your music! But truth be told, this isn’t something that would influence my buying decision. It’s nice to have, but definitely not something that’s absolutely required in my opinion. Built In Speakers To Play Your Favorite Tunes! The Perfect Chair For Air Compression! If you’re looking for a chair that’s specifically good at air compression massage, this is it! 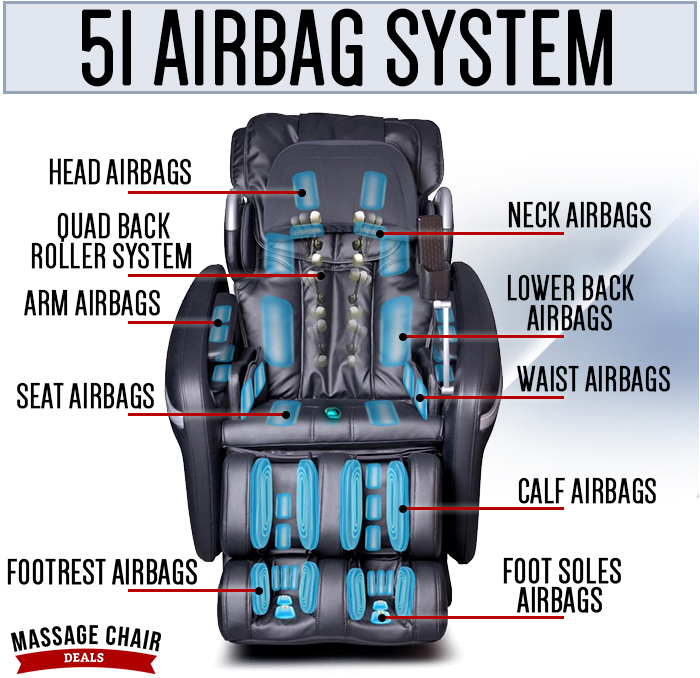 51 airbags filled with compressed air is probably enough to knock your socks off. What’s also neat is you have the ability to vary airbag intensity to 5 different levels. In my opinion you’d be hard pressed to find a better compression massage chair in the market. I was surprised to learn that this thing only weighs about 231.1 lbs. I’ve seen massage chairs with half as many airbags that weigh significantly more. Weight is more important than you think. It’s important for assembly and installation obviously, but also a factor when it comes to moving or relocating the chair. If it’s heavy, it’s gonna be a pain to move! Heating Pads On The Shoulder Area! Here’s one thing I really like about the OS 7200H. Unlike other chairs, the OS 7200H has 2 heating pads located on either side of the shoulder. Most chairs I’ve seen have 2 heating pads located on the lumbar/lower back area. I prefer heat on the shoulders mostly because my muscles in that area are a lot tighter and stiffer, and heat will help loosen them up tremendously. Osaki OS 7200H is one of the few chairs that will do a head massage. How does it achieve this? 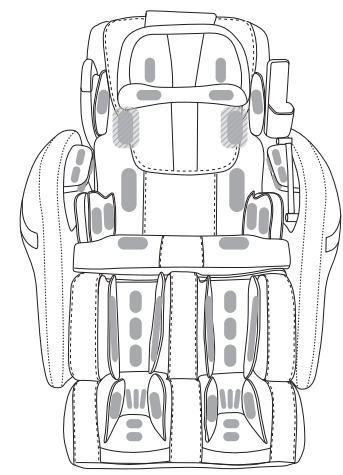 There are 2 head airbags located on either side of the head cover that will inflate with compressed air. There’s also 2 neck airbags on either side directly below the head airbags that will also inflate. Head cover padding can be removed for even more intensity! As mentioned previously, I am a little disappointed with the 31” roller track span. It’s nice that Osaki have taken air compression seriously, but it almost seems that they forgot about the rollers. 31” is what I’d expect to see in an entry level chair, but then again maybe my expectations are higher than most! To make it easy, I’ve narrowed it down to 2 types of people. If you’re one of the 2, you may want to consider this chair! 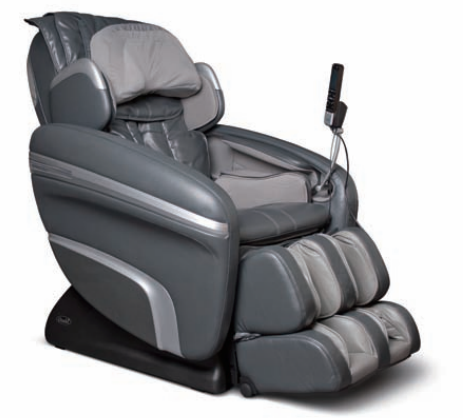 Make no mistake about it, OS 7200H is very much a compression oriented massage chair. If you’re a fan of compression style massage, then it absolutely makes sense to get it. On the flip side, if you prefer roller based kneading and tapping techniques, there’s better chairs out there at a similar price; TP-8500 and Pro Maxim are great examples of this. I’ve written comprehensive reviews for both which you can check out by clicking the links. It ain’t cheap! Then again, it does come jam packed with all the bells and whistles. If your budget allows a spend of about $3500, then this is one of the many chairs you ought to consider. With an investment as large as this, you should avoid buying on an impulse. Take the time to research, so you can find the best possible deal! I’m sure you’ve noticed by now, but if you haven’t, I have affiliate links in this post which will redirect you to massage chair deals. And yes I will receive a commission should you decide to purchase from them. I tell you this because you deserve to know both as a reader and a potential buyer. But i’ll also tell you why I recommend massage chair deals! We Both Benefit!—As a special thanks for reading my post and listening to what I have to say, feel free to enter “MAM5” during checkout and receive an extra 5% off! For a chair that costs $3500, that’s $175 off! Lowest Price Guarantee—They will match the lowest price, and potentially beat it! Free Curbside Shipping—Shipping’s free on all massage chairs. Can’t beat that! There’s tons of other great benefits to buying from massage chair deals. Interest free financing, 24/7 customer service, and in general these guys know their stuff! Even still, I encourage you to research the heck out of this chair (or any!) 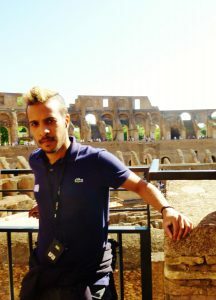 before buying. You’d be doing yourself a big disservice if you didn’t! If and when you’re ready, feel free to use my affiliate link conveniently placed below! And don’t forget to use “MAM5” for an extra discount at checkout! Amazon—Click here to check out latest pricing for this chair (affiliate link). Go Local—A quick google search will reveal massage stores in your vicinity. Pay them a visit and see what they have to offer! The benefit to going local is you get to try the chair out before buying. Costco—Check out your local Costco. I know last time I popped into Costco, they had a select few massage chairs. Definitely worth a shot! I’l reiterate again in case you skimmed the post and ended up here. 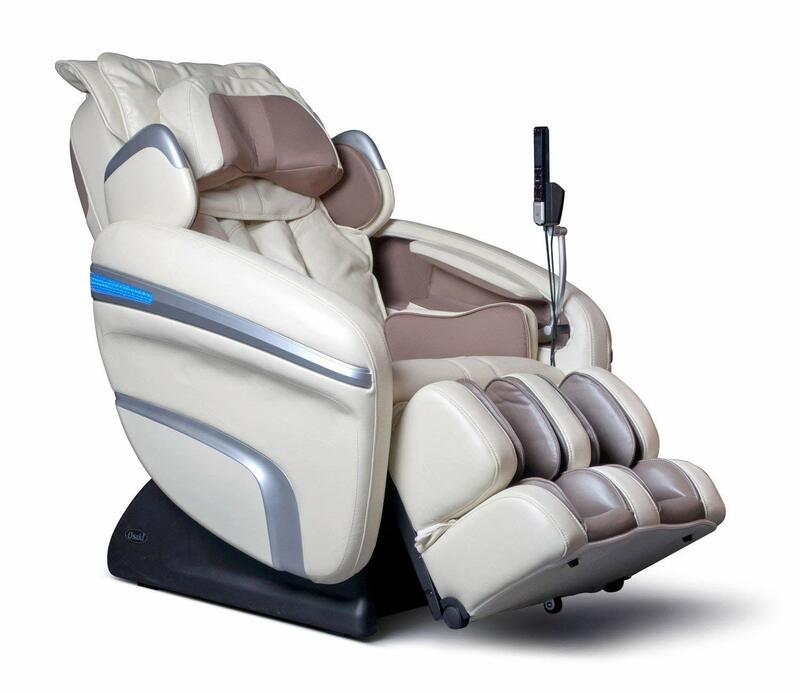 The Osaki OS 7200H is best suited for anyone who loves compression massage! Simple as that! I’ve tried to write this review from as much of an honest and unbiased view as possible. That’s of course very difficult to do given the incentives I have! If you disagree with any of the points presented in this post, definitely feel free to reach out by sending me an email at support@massagersandmore.com. I take my content very seriously, so I promise to review your email and respond as best as I can. In the end, my goal is to help you find the right massage chair, and if I can achieve this, i’ll be more than happy! Thanks for reading. If you got some value out of this, please consider sharing on the socials! See you in the next one!